The All Harley Drag Racing Association (AHDRA) is headed for No Problem Raceway, September 17th and 18th, for the fastest Nitro-Harley action on earth at the Cajun Nitro Nationals. 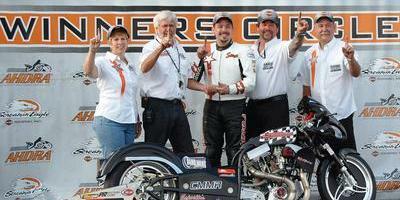 Fans will see tire-smoking, fire-breathing, 230mph Screamin’ Eagle Nitro Harleys conquer the quarter mile strip in six seconds along with modified gas bikes, pro stock, street bikes, and more. 7:00 pm featuring the Nouveau String Band. Buffalo Wild Wings is located at 4415 Ambassador Caffery Parkway in Lafayette, LA. For more information, please call 337-984-7990 or visit their website at www.buffalowildwings.com. In addition to the action on the track, fans can also visit vendor row for all their favorite biker treats along with popular manufacturers. Be sure to stop by the AHDRA Merchandise Trailer for your event t-shirt and other AHDRA souvenirs. AHDRA proudly welcomes the Harley Owners Group for an Official H.O.G. Pitstop. H.O.G. members will receive a free pin at the Pitstop with paid admission. No Problem Raceway will host a Test and Tune on Friday, September 16th, exclusively for AHDRA bikes from 1:00 pm until 5:00 pm. The charge will be $50.00 per bike. The track is also having a Trophy Bracket Race on Friday evening. Racers that participate in the Test and Tune are welcome to participate in the nighttime festivities at no extra charge. No Problem Raceway will charge everyone who comes through the gates on Friday an admission price of $5.00. Racing gets underway Saturday, September 17th, with qualifying at 9:00 am. On Sunday, September 18th, eliminations begin at 12:00 pm (noon).